At the World of Beer, the $12 chimay burger, foreground, is piled high with chimay sauce, sauteed mushrooms and onions on a briche bun. 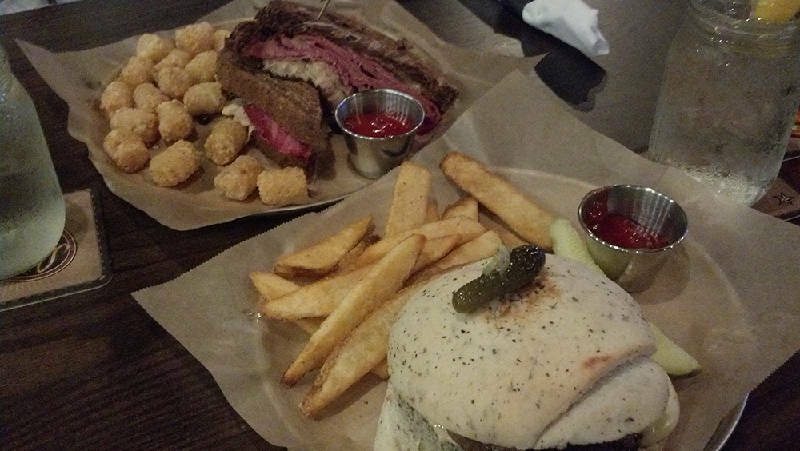 The $10 traditional Reuben, in back, is served on marble rye with a side of tater tots. • Where: World of Beer, 412 Market St.
Just the name World of Beer makes the taste buds start longing for something cold and sudsy. But it was also dinnertime, so my wife and I were hopeful the new restaurant at the corner of Market and Fourth streets had eats to match. World of Beer, which was created by two friends in Tampa, Fla., in 2007, already operates 55 stores, and more are in the works. World of Beer is geared toward the sports set with well over a dozen flat-screen televisions offering up the night's lineup of baseball, football, golf and sports news. There is a long bar inside and another on the patio separated by an open-air partition that made me glad I wasn't paying the electric bill. Not surprisingly, menu items go with beer and have suggestions for pairings. They lean a little toward Southern comfort food. Appetizers include World of Beer's original pretzel ($8), black and tan onion rings ($6), tavern taters ($7), golden ale shrimp ($9), seared ahi tuna ($12), artisan sausage board ($15), pickle chips ($6), mac & cheese ($6) and sriracha lime shrimp tacos ($9). There also are wings ($6 for a five, $10 for a 10, $19 for 20) that come either dry-rubbed or with buffalo, garlic parmesan, hot honey barbecue or chipotle porter sauces. Meals start off with flatbreads that features an Italian version, margherita and chipotle barbecue chicken. All are priced at $7 (regular) and $12 (full). In the burgers and sandwiches category, the lineup includes Guinness brat sliders, turkey club, Reuben, a flat-iron steak sandwich, chipotle chicken, barbecue bacon burger and a chimay burger. Prices range from $8 to $12. There are four main plates, starting with steak frites ($15), a marinated flat-iron steak grilled and sliced, served with hand-cut fries and garlic aioli for dipping and a side of fresh vegetables. The fish and tots ($12) are crispy beer-battered cod pieces with tater tots and house-made tartar sauce. Baked crab cakes ($14) are drizzled with lemon garlic aioli and house-made apple and kale coleslaw. The beer-brined grilled chicken ($12) is served over pancetta fingerling potatoes. Three items are gluten-free: artisan sausage board, baked crab cakes and World of Beer wedge salad. Soup and salad selections include the soup of the day ($5), spring greens and kale slaw ($7), soup and salad combo ($8) and the WOB wedge salad. Sides include apple and OVERSET FOLLOWS:kale coleslaw ($2.50), wedge fries ($2.50) and tater tots ($2.50). There are literally hundreds of choices of craft beer on tap or in the cooler, so many that for some people, it's mind-boggling. The selection - I found it pretty overwhelming - has offerings from craft breweries across the region, U.S. and around the world and offer something for almost every taste. There are easily 50 or 60 taps. Snob or not, you should be able to find something to quench your thirst. Most prices range between $5 and $8 a mug. I got the chimay burger ($12), a half-pound beer patty piled high with chimay sauce, sauteed mushrooms and onions served on a brioche bun. It came with a side of wedge fries and a pickle. My wife chose the Reuben ($10), consisting of corned beef, sauerkraut and Swiss cheese with tangy dressing, pressed between slices of toasted marble rye. It came with tater tots and a pickle. I ordered my burger cooked medium, but it arrived more a medium-well or well and it was kind of dry. Fortunately, the chimay sauce, mushrooms and onions made it nice and juicy. The hand-split brioche bun was deliciously fresh, soft and light-textured. The fries were nicely seasoned and perfectly crispy. My wife said her Reuben was good and above average compared to most pub offerings around town. She didn't like that the bottom piece of bread became a little soggy from the steam, but the meat, sauerkraut and dressing were moist and plentiful. The tater tots she deemed "awesome, crispy and perfect." When we arrived, the bars inside and out were packed and several of the tables were filled, though there was still plenty of room inside and on the patio. Lindsey, our server, appeared quickly, returned just as quickly with refills and checked on us every few minutes to see if we needed anything more. Other servers also checked on us as they passed. The whole staff was very attentive. For our tap beer pairings, I went with the Blackstone Hop Jack ($5.50) and my wife chose a mug of Boulder Shake Chocolate Porter ($6). Both were expertly poured in what I think were 16-ounce mugs. World of Beer, with a capacity of just under 300, took up residence this summer in what was last a Mexican restaurant. It's inviting with it's open-air covered patio, new decor and furnishings. A small stage is situated between the patio and inside dining area where, the night we were there, a guitarist was playing. The booth we sat in was comfortable if a little tight, and there were lots of high-top tables if you don't like booths. Face it, if you're going to World of Beer, you're really going for the specialty of the house: beer. But if you're hungry as well as thirsty, the menu has plenty to pick from and quality is above average. We'll be back. I want to nab a pile of wings or try one of the steak sandwiches and sample more than just an accompanying brew. Contact Ben Benton at bbenton@timesfreepress.com or twitter.com/BenBenton or www.facebook.com/ben.benton1 or 423-757-6569.